​The heritage of Italians in the Okanagan Valley stretches back almost 140 years, to when Giovanni Casorzo first claimed his homestead on the banks of Mission Creek. Since then, the stories of La Nostra Famiglia Italiana have been a vital part of the valley. Our goal is to reconnect with these stories and bring them alive again. We’ll collect, curate and share them with our members and the community. We’ll also help you discover the stories of your own family through the resources now available for genealogical research. The meetings will be open to all who are interested, so reach out to family and friends and extend an invitation. ​Everyone is a member of our family! To register for any of our events, fill out the form at the bottom of this page! 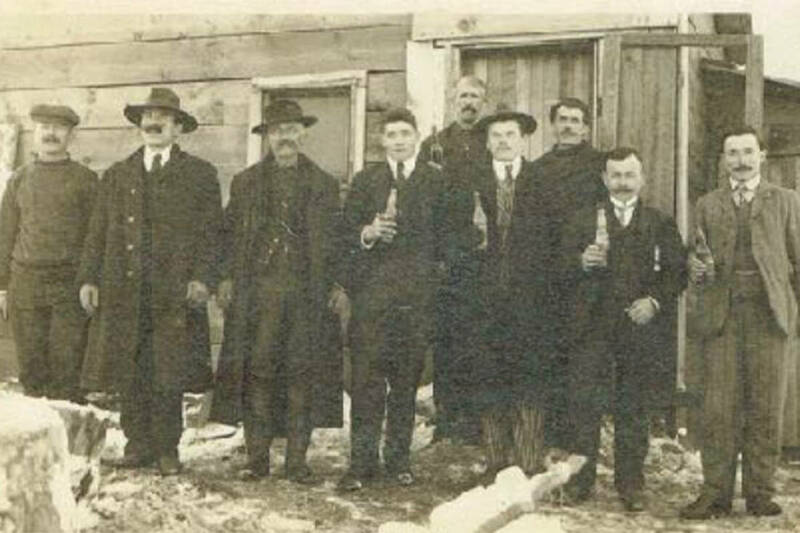 Contributed Luigi Rampone (third from the left) seen here in this 1914 photograph with his son Camillo (to his left) and his friends (left to right) Tony Risso, a man named Tuscano (first name missing), Vincenzo Risso, a man named Fullano (first name missing), Giovanchino (Joe) Lanfranco, Tony Casorso and another man named Fullano (first name missing). Slide show on THE RAMPONE family genealogy. Travelling through the Piemonte area of Italy. Stories of and about the Piemonte area. Tools for making your own family tree. ​family tree has been constructed. ​and arrived in Kelowna in 1893. Learn more about the men who built the Kettle Valley Railway. Many of the labourers and “blanket stiffs” were from Italy, recruited for their skill in stone masonry. Well-known local historian Dr. Maurice Williams, professor emeritus in history at UBCO, will be joining us for this fascinating chapter in the history of the Okanagan. He’ll cover what life was like both at work and in the camps, especially from the perspective of the Italians. Registration is free and is open to all (non-members are welcome) but we do like to know how many people to expect. Please let us know if you will be attending our sessions by filling out the quick form below.